High-speed photonic and electronic devices at present rely on radiofrequency electric fields to control the physical properties of a semiconductor, which limits their operating speed to terahertz frequencies (10^12 Hz). Using the electric field from intense light pulses, however, could extend the operating frequency into the petahertz regime (10^15 Hz). Here we demonstrate optical driving at a petahertz frequency in the wide-bandgap semiconductor gallium nitride. 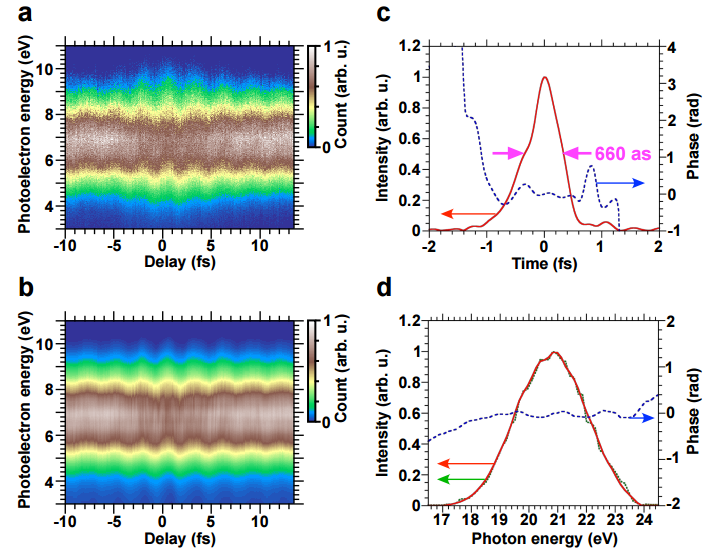 Few-cycle near-infrared pulses are shown to induce electric interband polarization though a multiphoton process. Dipole oscillations with a periodicity of 860 as are revealed in the gallium nitride electron and hole system by using the quantum interference between the two transitions from the valence and conduction band states, which are probed by an extremely short isolated attosecond pulse with a coherent broadband spectrum. In principle, this shows that the conductivity of the semiconductor can be manipulated on attosecond timescales, which corresponds to instantaneous light-induced switching from insulator to conductor. The resultant dipole frequency reaches 1.16 PHz, showing the potential for future high-speed signal processing technologies based on wide-bandgap semiconductors.